Like many other investors I am a big fan of Seeking Alpha as it is a terrific resource to research companies, markets, and to get a wide variety views regarding important economic, societal, and business trends. One of the most prolific writers there who I follow is Jeffrey Snider. His writings are very challenging to comprehend and quite complex at times. After reading a lot of what he has written over the past couple of years I think I finally get the essence of what he is saying. 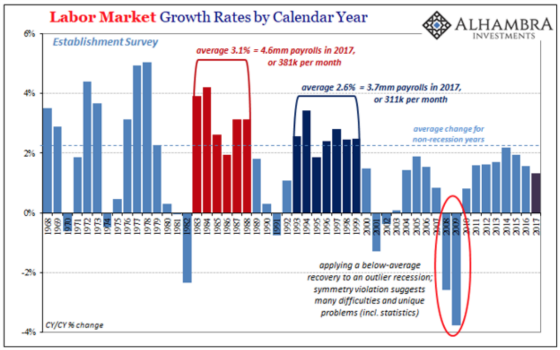 His main point is that we have never really recovered from the Great Recession in any sort of way that reflects a solid, typical recovery other than as measured by the stock market and unemployment rate. Maybe on a relative basis things are better but on an absolute basis, they are very weak except for the very wealthy. 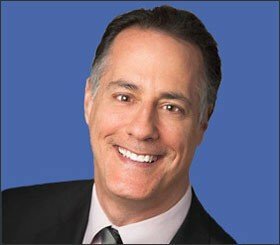 Is the Fed Using the Right Measure? Snider is a disciple of Milton Friedman so he is a monetarist. This means that economic growth and inflation are highly influenced by the supply and demand of dollars, and not just those created by the Fed, but by the banking system. 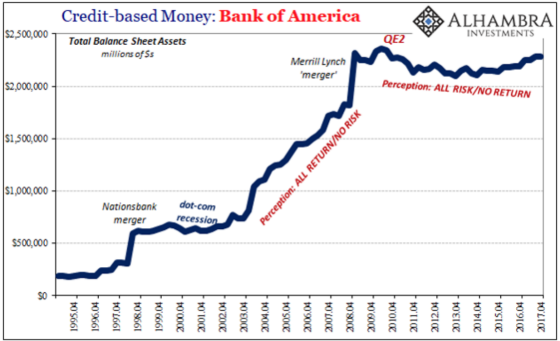 Over the years he has asserted that since 2007 there has been a breakdown in balance sheet capacity by global banks that have led to a “dollar” shortage. By “dollar” he means the monetary fuel to propel our modern fiat based currency system forward. 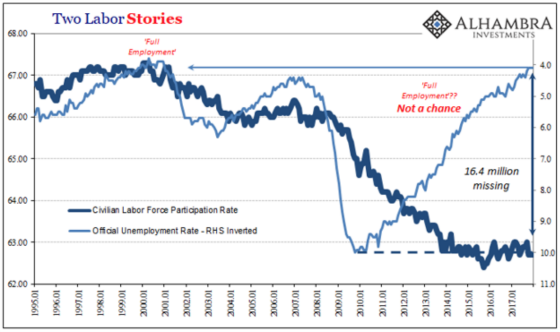 He believes that the unemployment rate is the one indicator that the Fed is obsessively focused on in a misplaced way. He thinks there are too many other pieces of evidence that show that there is slack in the labor system and the Fed is missing the boat in terms of trying to improve the lives of Main Street by being hyper-focused on Wall Street. 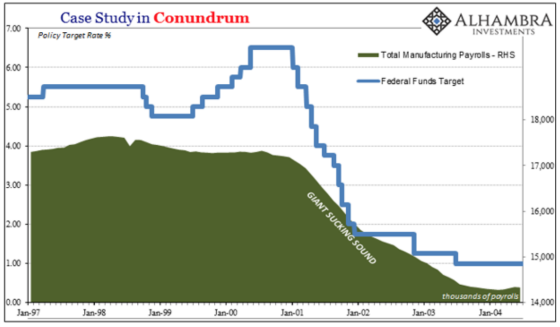 Since a picture is worth a thousand words, I thought I would use a sampling of some of the charts he deploys to help make the case that this is not a strong recovery at all and that is why Treasury yields have befuddled economists for so long by not having risen like they think they will every year to 3%+ (down from 4%+). 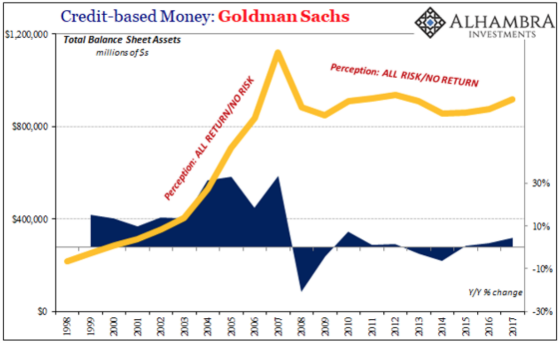 First here is an example of bank balance sheet capacity constraints stemming from going from an environment of perceived risk-less profit to profit-less risk using Goldman Sachs and Bank of America as examples. This regime shift to risk management from profit maximization has fed back into the real economy and of course vice versa. 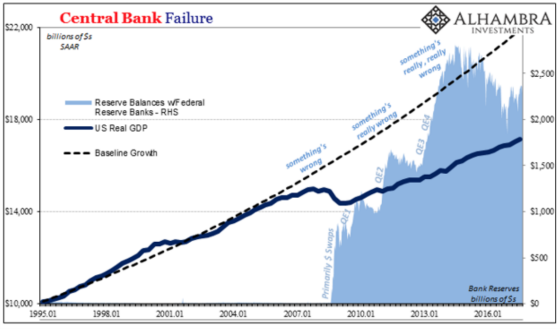 The next chart shows the trajectory that GDP should have been on had it followed its pre-crisis trend line and where it is now despite the tremendous amount of Federal Reserve monetary stimulus generated through its quantitative easing programs. 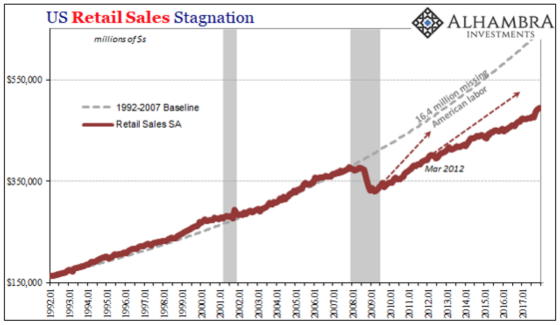 Not surprisingly, retail sales have grown substantially below trend as well since sales are a big component of GDP through consumption of goods and services. 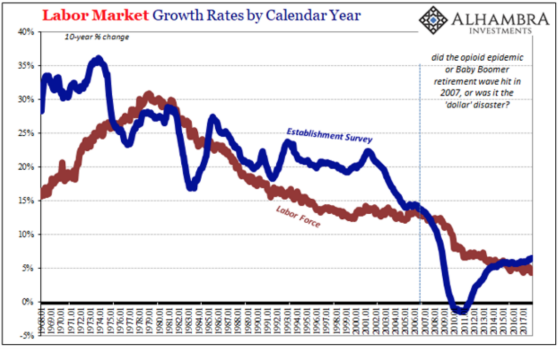 A big component of the GDP slowdown is the much slower rate of growth of the labor force, which is due to an aging society and a much lower participation rate and this has translated to much slower hiring and is also impacted by lower economic growth than in past recoveries. The following chart shows 10-year rolling averages for non-farm employment and the labor force. This next chart shows how the unemployment rate has come down significantly but, unfortunately, it has as much to do with a declining labor force participation rate as it does with increased employment. Although this job growth expansion is longer than most previous ones, it is also a shallower one as the chart shows. This next chart shows the challenges to employment growth due to automation and improved productivity. Manufacturing employment has been dropping for decades and despite Trump’s desire to create a manufacturing renaissance, the trend is to create more output with less input, including labor. 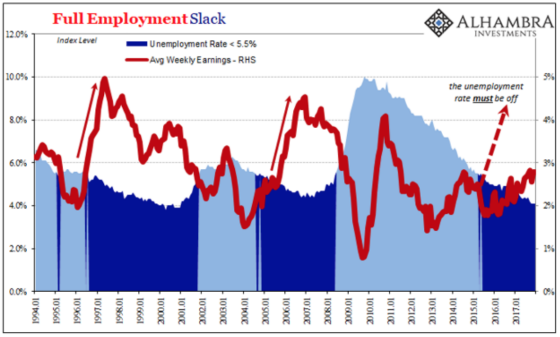 This is one of the more damning charts for the Fed Phillips Curver as it shows how anemic wage growth has been despite a significant drop in the unemployment rate. One can see that wage growth is more akin to a recession than boom times (more on this later). Even housing, which has been one of the consistent bright spots in the economy, is far off of its peak despite very high builder confidence. Of course, the previous peak was a result of a financing bubble that was proven to be unsustainable. Nevertheless, this “boom” in housing is coming at production levels that were previously at levels seen during recessionary bottoms. 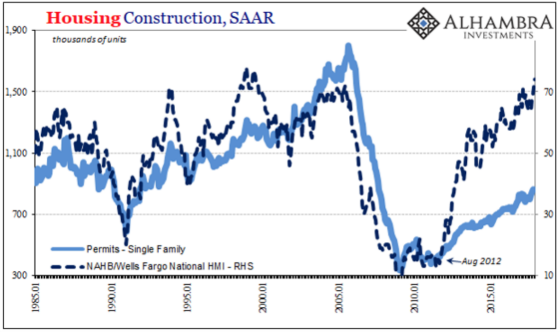 This has a similar feel to the previous graph in that soaring builder confidence is like the very low unemployment rate and, yet, like wages, housing production is anemic. 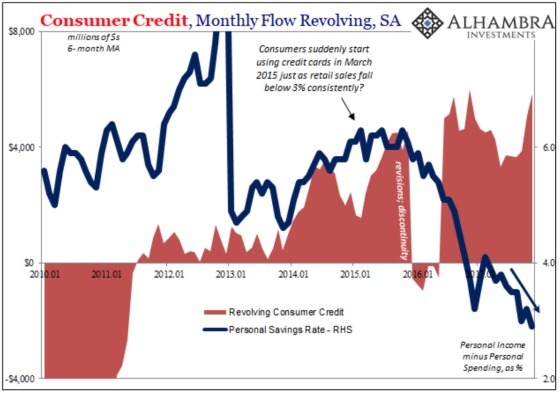 One can see that consumer borrowing has accelerated at a time when the personal savings rate has dropped to a very low level. 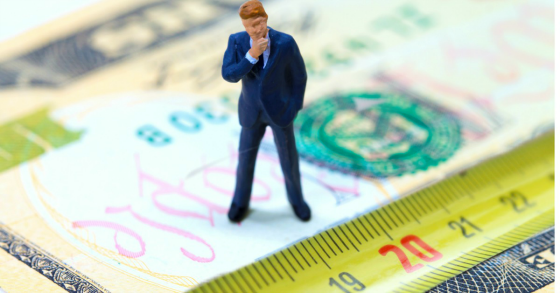 Being a disciple of Friedman, Snider believes, somewhat paradoxically, that the chronic low-interest rates are a sign of money being tight in the economy and not too loose. Friedman called this the interest rate fallacy and this is what he said about it in 1998 in terms of Japan. One can see what Friedman was talking about in Japan as the M3 money supply contracted during the time of his writing.despite interest rates being very low. Here is a graph he put together of three of the variables to pictorially determine if we were in a boom. Assuming my eyes don’t deceive me then I would say we are nowhere near a boom which is what Snider has been saying. We have Phillips Curve obsessed economists running or influencing the Fed who are worried about the inflation bogeyman just around the corner when in fact they are focused on the wrong variable as the mosaic has formed an image that shows we are not in boom times, monetary policy may actually be too tight, and the economy can run a lot hotter. “We have sound money when our system behaves in such a way as to help rather than hinder the full and efficient use of our productive resources. We have sound money when the energy and skill of American workers, the productive capacity of our great industrial plant and equipment, and the fruitfulness of our land and natural resources are used in such a way as to make our real income of goods and services as large as possible, not merely for a few prosperous years followed by a period of idleness and want, but for year after year of enduring stability. This, it seems to me, should be the criterion of the soundness of money, and not the amount of gold that is stored in the vaults of the Treasury.